There is something wrong with me. 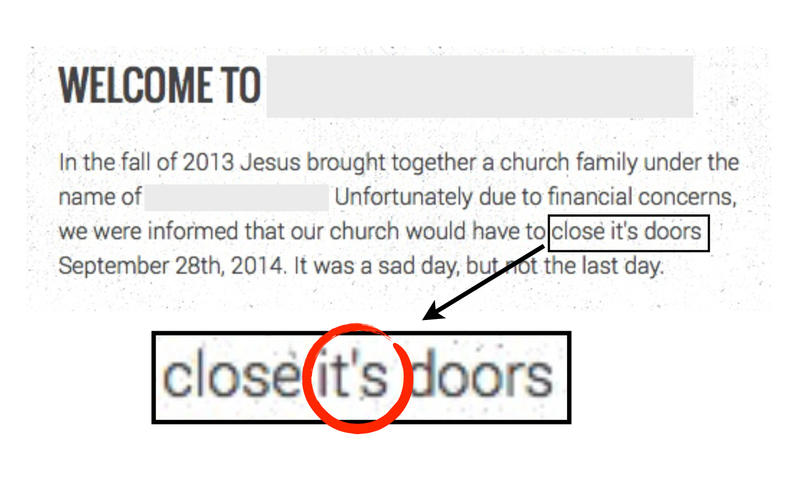 Well, before I get to that, there is something wrong with a website for a new church plant. The image above includes a screen capture from their front page. This really bothers me and I hold out hope that I’m not alone. A few days ago I sent an email to the contact listed for the website. With all the problems in the world (and all the problems that you are going to have when you start a church), here I am twitching about this. Yes, there is something wrong with me. 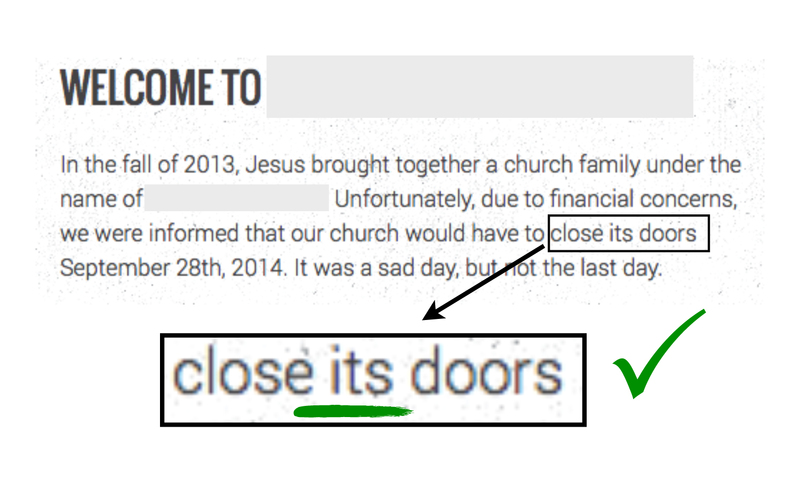 Since I didn’t get a response and the offending “it’s” remains in all its spectacular wrongness on their website (Are there no English majors in this church start? ), I am wondering if my email got through. And if it got through, why hasn’t the website been corrected? Am I wrong? (Don’t think so.) Do they disagree? Fine. Say so. I can’t begin to say how good this feels. Something in this world has been improved. The crooked painting on the wall has been straightened. That piece of lint on that beautiful suit has been removed. Bless the good folks at this new ministry for responding to my email in the best possible way. The world has one less typographical error, which is not nothing. I do wish them well in their endeavors. Selfishly, I am grateful for one less thing to be twitchy about. My work here is done.